One Plus comeup with a biggest contest of the year, Vote for Best smartphone of the year to win 1 crore cash and many more prizes. How Many Points you can Earn By completing Task? Maximum 1200 points for each task can be earn. New tasks added every Wednesday. Complete as many tasks as you can every week to earn points. A person can participate in the Best smartphone contest by buying the OnePlus 3T from official channels including Amazon.in, OnePlusStore.in and OnePlus Experience Store and winning a Dash Pass to the lucky draw for the Grand Finale. The rules and regulations through this channel shall be governed by respective channel partners. Please note: Lucky draw ticket is only valid for a single purchase from one account. In case of no reply or inability to participate in the final round from any of the 10 lucky draw winners, their entry will lapse and passed on to another user who will also be selected basis a random draw. 5. Winners of the lucky draw will then be inducted into the final round, details of which will be shared at a later stage. 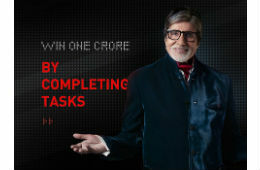 5 of these winners will get a golden ticket and meet Amitabh Bachchan for a chance to win Rs. 1 crore cash prize. The other finalists will win the OnePlus 3T.